A new robotic walking device tested for the first time today at the Santa Clara Valley Medical Center in San Jose could allow wheelchair using people to walk in and outside their homes, a company official said. 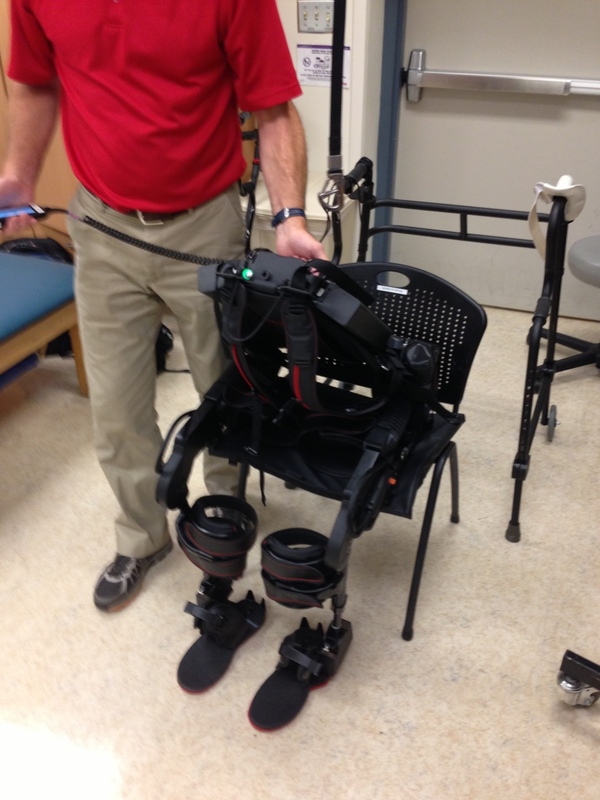 The Esko 1.2 exoskeleton machine is strapped to the body, makes a sitting person stand and artificial joints move their ankles, knees and hips forward, Esko Bionics clinical director Darrell Musick said. Esko Bionics, a firm based in Richmond, tested the latest prototype so-called “wearable robot” today after introducing one in early 2012 that helped people who are paralyzed to walk, Musick said. This latest model, used for the first time in the field today at the medical center, runs on a new software so therapists can adjust it for patients with various ailments such as paralysis, multiple sclerosis and stroke-related neurological problems, Musick said. 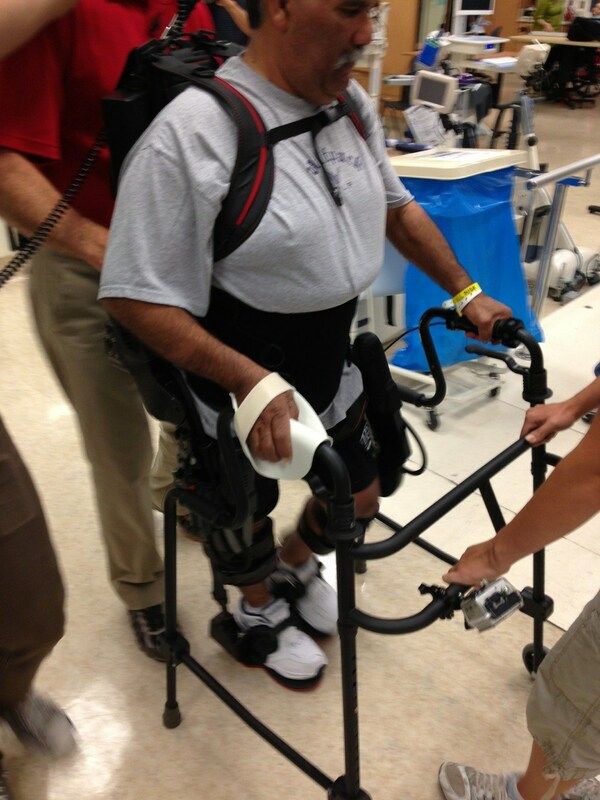 Patients can use the computerized robotic suit to rehabilitate their muscles and improve their ability to walk on both legs, Musick said. The $110,000 device is now only being sold to places like valley medical’s Rehabilitation Research Center but Esko has a plan to release it to consumers for use at home in about two years, he said. “The company is working on a goal for a personal devise that would be customized to a patient that is unable to walk without this technology,” Musick said. Even someone with full paralysis would be mobile with it on, Musick said. “When we hit the market with the personal device, it is going to be for ramps, stairs, be compatible with somebody’s daily activities,” he said. “They are going to be able to climb in a car, drive to the store and walk around in the store,” Musick said. “It still will be partial wheelchair and partial walking initially, but as the technology goes marching on you’ll probably have on a suit full time, like a bionic suit, that will eventually happen,” he said. On Wednesday, the company is to deliver the new advanced Esko 1.2 personalized for home use to Amanda Boxtel, a former skier in Colorado who has been paralyzed for 22 years and began using the company’s first model suit in 2011, Musick said. The robotic suit accepts a person weighing up to 220 pounds and between 5 feet 2 inches and 6 feet 4 inches tall, Musick said. The company and medical center therapists today tested the machine at the center on a few patients, including Richard Torres, 51, whose right side was paralyzed from a stroke, the center’s rehabilitation director Stephanie Kolakowky-Hayner said. 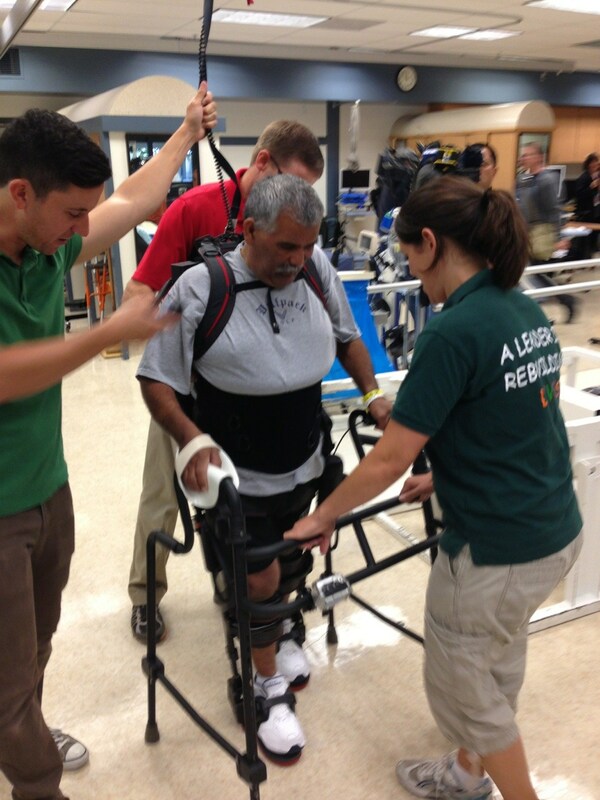 With the help of three attendants, Torres walked in a circle around exercise machines and a pair of rails normally used by people like him to walk with braces on with the computerized robotic device strapped to his body. Walking for almost 13 minutes with both his good and bad sides guided by the robotic legs, Torres took a total of 361 steps, Musick said. “In a normal session, he would have been able to walk maybe 30 steps before he tired out,” Musick said.